Do young Americans today know anything about economics? No, they don’t, according to a study during the 2016 presidential primary season, which says lots of other Americans don’t either. The survey found 58% of millennials favor government-run socialism (statistically 6 out of 10), while a nearly identical number (64%) don’t want government interference in free markets. The incompatible findings make no sense, unless… Americans aged 18-24 simply don’t understand the real meanings of either concept. Sadly, the study says that’s true of one-third of all Americans. Not a clue. The evidence is the large following behind avowed socialist Bernie Sanders during his presidential campaign. This lack of understanding is concerning, as the implications for individual lives and the nation’s future are significant. Witness the latest failure of socialism in Venezuela, where millions are rebelling against the government-controlled economy driving their lives into the dirt. We know one answer. The thrust of government influenced, politically correct education for many decades has been to rewrite history and literature, aimed at growing government power while diminishing individual liberties. It starts with childhood. Ask anyone, and you’ll hear Robin Hood was the guy who robbed the rich to give to the poor. The ingrained implication is clear – sharing the wealth through class conflict is the way to go. Balladeers passed along this folk tale beginning 600 years ago. 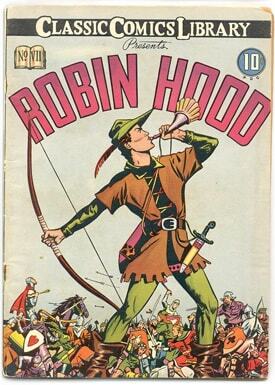 Since silent movie days, Robin Hood has been played as champion of the oppressed by every major entertainer from Errol Flynn to Kermit The Frog. Even Bill Clinton marketed the popular view in recent days. “I was sorta Robin Hood,” he said, defending the millions he’s raked in selling influence around the globe. We’re sorry to bring this up now, but we’ve all been living a lie. The “rich” in Robin Hood’s days were primarily government bureaucratic officials, bestowed with royal titles, and beholden to the king. Robin’s constant nemesis was the Sheriff of Nottingham, the onerous, tyrannical tax collector. The Merry Men of Sherwood Forest were in reality anti-government, anti-tax activists! Robin Hood was busy hijacking the IRS! But that’s certainly not a plot line government’s compliant educators wanted planted in young, inquiring minds. Over the years they pushed a wholly incorrect socialist view of Robin Hood, burying the anti-tax storyline. A few weeks after you elect a new president, win or lose, you’ll want time to enjoy the holidays. MGM’s The Wizard of Oz will air often between Thanksgiving and Christmas, a screen classic now for 77 years. What you’re getting is another rewrite. You’ll see Judy Garland as Dorothy, ripped from her home by a tornado, off to discover the truth of courage, intelligence, and heartfelt compassion. Then, in 1963, a New York high school teacher was preparing a lesson plan on the history of sound money. Before he knew it, Henry Littlefield had written a scholarly study, the first to recognize author Lyman Frank Baum’s fantasy classic as historical satire of the bimetallism political fight of the 1890’s. In short, silver mining interests wanted government to put more silver into circulation, while officially recognizing both a gold and a silver standard. The argument became one of choosing the meaning of money for yourself. Bimetallism was a major populist issue in the 1896 presidential election, with “silverites” opposing bankers and industrialists, who preferred gold as the sole, standard accounting unit. Baum had strong political sentiments. Years before he wrote his classic, he marched in demonstrations with the “silverites.” His many books satirized other social issues, including feminism and suffrage. 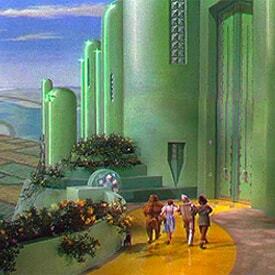 Littlefield concluded Baum’s Wizard of Oz was a satire about the value and future of sound money. That would not be what Franklin Roosevelt wanted to hear in 1939, when MGM cast Hollywood’s first “girl next door” in her iconic role as Dorothy. FDR had just grabbed America’s gold six years earlier in 1933. Gold as currency was out the door, moving ever so farther away from America’s consciousness. There was no political appetite to explore the economic politics of sound money evident in Baum’s allegory. Why bring it all up again in a star studded mega-hit destined for the ages? Left on the cutting room floor was the “magic power of silver” that would show Dorothy the way home. Her original “silver shoes” following a road of yellow bricks (allegorical gold ingots) were changed to red rubies. With merry bands of tax reformers successfully morphed into free-stuff socialists, with sound money hidden behind still another curtain, government was encouraged to write its own financial fictions, performed on the world stage by compliant educators and media. Today’s best-selling government fairy tale is that debt is actually wealth, that countless trillions in paper and digital currency can be spread around the world without catastrophic societal upheaval. The fantasy ignores sound money and belittles those who separate fact from fiction. This fable teaches the more unpayable debt, the merrier. This month, the national debt reached $19.5 trillion, up a half trillion in seven months. That’s deceptive. Add $12 trillion in America’s household debt, hundreds of trillions more in future, unfunded government promises, and what you’ve got is a very scary movie. A trillion is written as a 1 with 12 zeroes. We looked for fanciful yet mathematically recognized numbers, and stopped at a millinillion, equal to 1,000 quingentillion. A millinillion is a 1 with 3,003 zeros. Join us in hoping some fairy tales never come true. *MoneyMetals.com columnist Guy Christopher is a seasoned writer living on the Gulf Coast. A retired investigative journalist, published author, and former stockbroker, Christopher has taught college as an adjunct professor and is a veteran of the 101st Airborne in Vietnam.